If you haven’t had a chance to see the movie Sing yet, you’re missing out on the fun and the world’s greatest singing extravaganza! In a world made up of talking animals, an optimistic koala named Buster Moon is trying to prevent his beloved theater from falling apart. A singing competition which promises a hefty reward, attracts the attention of several talented characters hoping to shine on the big stage. Rosita, a loving wife and overworked mom of 25 piglets, is one them. She spends her days cooking, cleaning, and tending to the needs of her family -something we can all relate to! After giving up her dreams of pursuing a career in music, Rosita knew this was an ideal opportunity to fulfill that lingering desire. A pig of many talents, she quickly became the star of the show and our hearts. 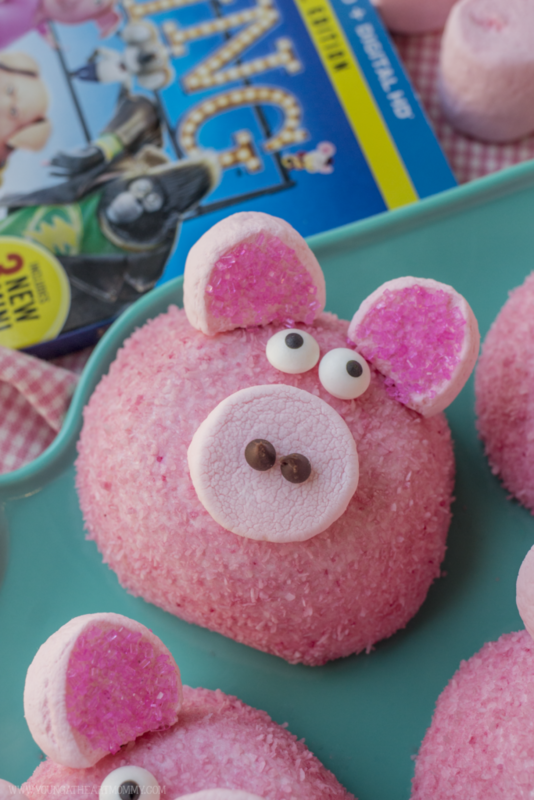 These Snowball Piggy Cakes are the perfect way to celebrate this multi-tasking mamma whose just trying to catch her big break. 1. 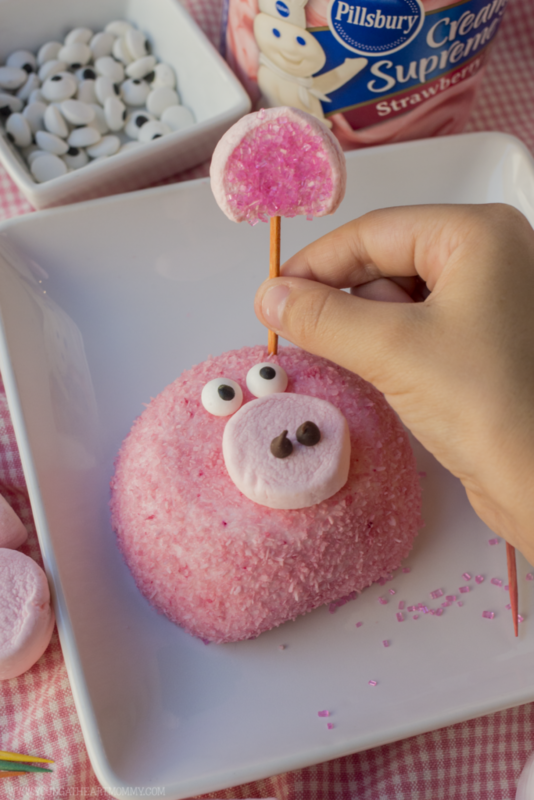 Use a clean pair of scissors to cut a marshmallow into three 1/4 inch discs for the pig’s nose and ears. 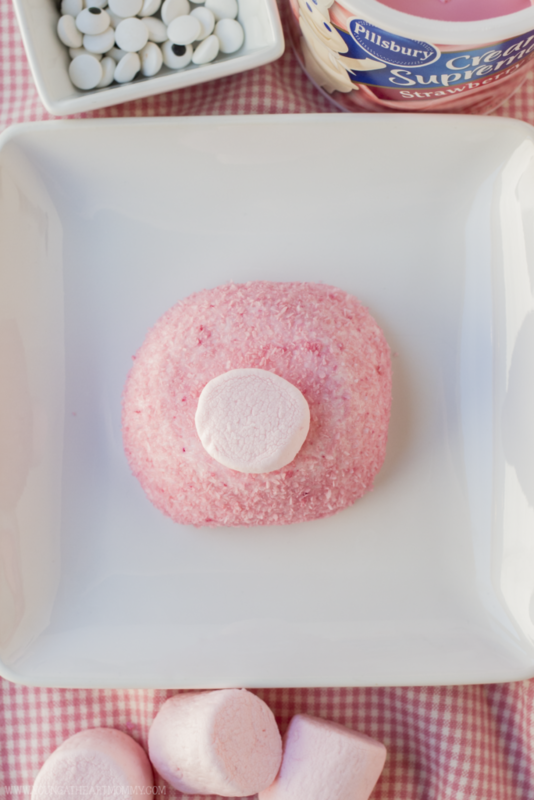 Place a thin layer of frosting on the back of one and attach to the lower center of the snowball cake. 2. 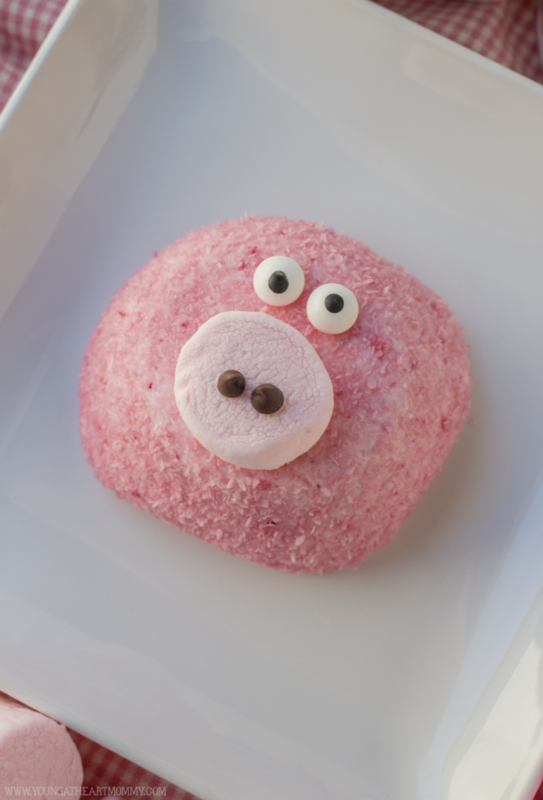 Also use a small dab of frosting to attach eyes and two chocolate morsels on the snout. 3. For the ears, take the two remaining pieces of marshmallow and snip the bottoms off so they become triangles. 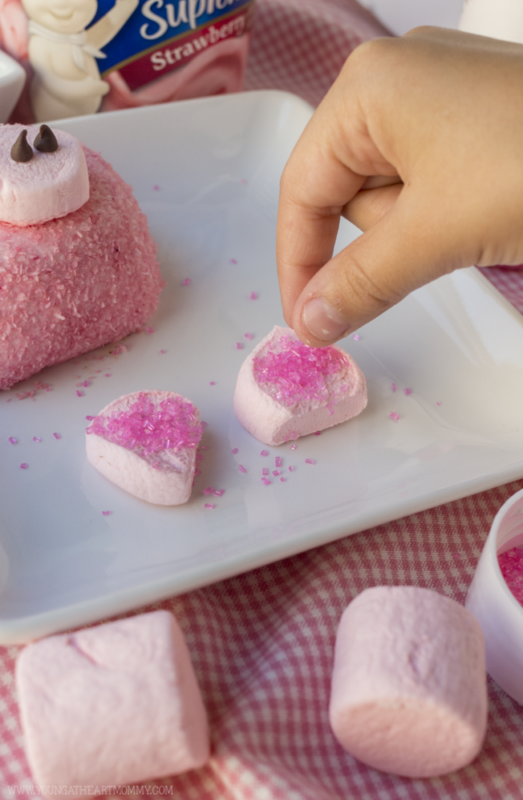 Sprinkle one side of each with pink sugar crystals, using your fingers to press them into the marshmallow. 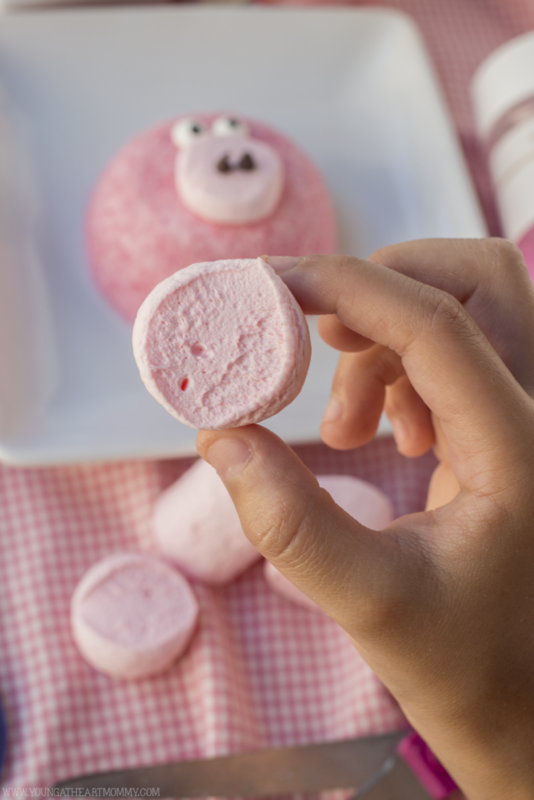 They should adhere to the sticky surface but if not, add a little frosting to help. 4. Push a tooth pick into the bottom of each ear piece, about 1/3 of the way through, being careful not to rupture through the marshmallow. Push the exposed ends of the toothpicks into the snowball. Want to win your own copy of Sing on Blu-ray/DVD/ and Digital HD? Enter to win the Special Edition here! Which animal from Sing is your favorite character? I am loving these! Now this I can make easily and they would be devoured just like pigs in an instant. These are so cute! I wish my granddaughter was old enough for these. I mean she is old enough, but she is picky at what she wants for snacks/sweets. She hasn't gotten to cakes like these yet. I am bookmarking this so I can do these for her in the near future, maybe even for her birthday party in July! :) Thanks! 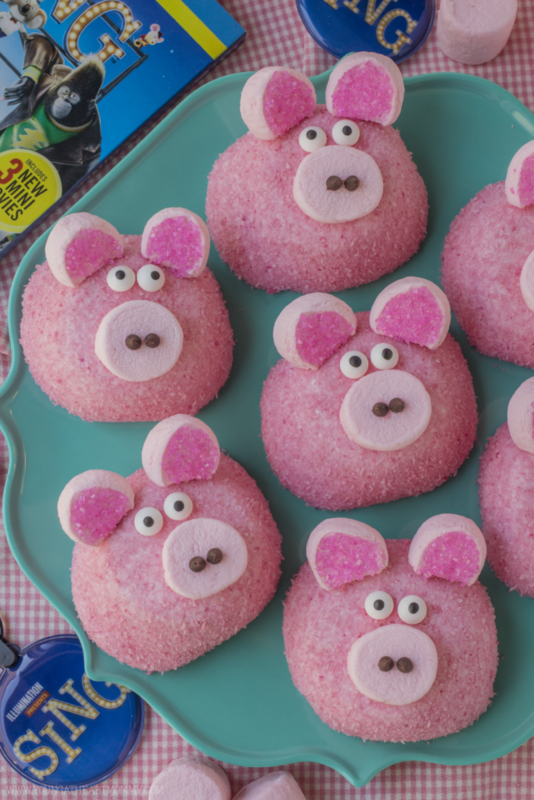 Yummy and amazing look Rosita Piggy Cakes. Oh my goodness. These are the cutest ever! Those are cute, and very creative! I would enjoy making these with my nieces, and I know they will have lots of fun doing it too. Thank you for sharing this!